Wood fences are often chosen for their aesthetic appeal. While it is expensive to build and maintain, nothing has quite the beauty of a board fence. Board spacing is governed by the type of fence you are building and what you are hoping to achieve with your fence. A fence meant to shield you from your neighbors will need different construction than a fence meant to keep in your horses. Ensure your boards are spaced evenly throughout the fence. Picket fences are commonly found around private residences, lining street fronts and walkways. The spacing for the vertical pickets depends on the empty space you want between them. You may place the boards so that they are touching, creating a solid fence or space them any number of inches apart. 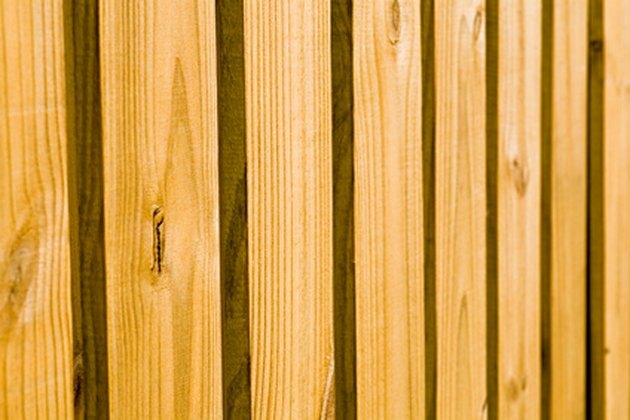 Constructed in a similar fashion to picket fences, privacy fence boards are typically flush against one another, creating a solid wall of wood between you and your neighbor. If you still desire the appearance of a fence as a opposed to a wall, leaving as little as 1 inch between the boards will not compromise your privacy. Livestock fences must be strong to stand up to the rigors that the animals place on them. Unlike picket and privacy fencing, these fences typically consist of horizontally mounted boards or rails, making board spacing of the utmost importance. Too much space between boards presents a hazard to a horse or cow attempting to graze through the fence. "Hobby Farms" recommends that spacing for livestock applications be no greater than 12 inches. Place the bottom board of wooden livestock fences no more than 12 inches off the ground to prevent foals and calves from accidentally rolling beneath it, according to the Penn State College of Agricultural Sciences. It is necessary to consult your state regarding fencing laws and regulations before building a fence that is on a property line or boundary. Some states require certain specifications for boundary fence construction and spacing. Most cities and towns allow fencing that is at least 6 feet from the property line or street and does not exceed a certain height. Check with your local government office to spare headaches down the road. When Building a Fence, Do Posts Go on My Side or the Neighbor's Side?